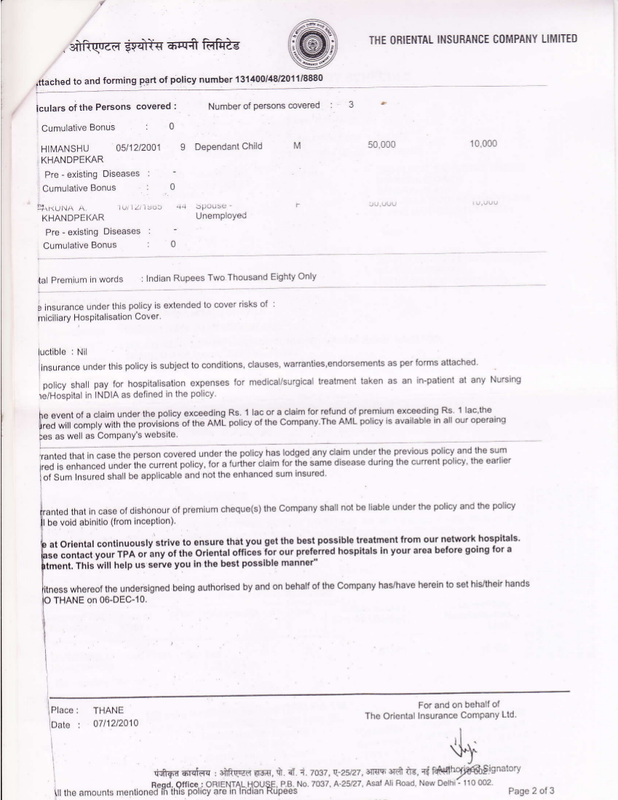 Rajesh Haldipur's Web Log: Oriental Insurance Rejects Mediclaim Claim Because Hospital Reduced Bill ! 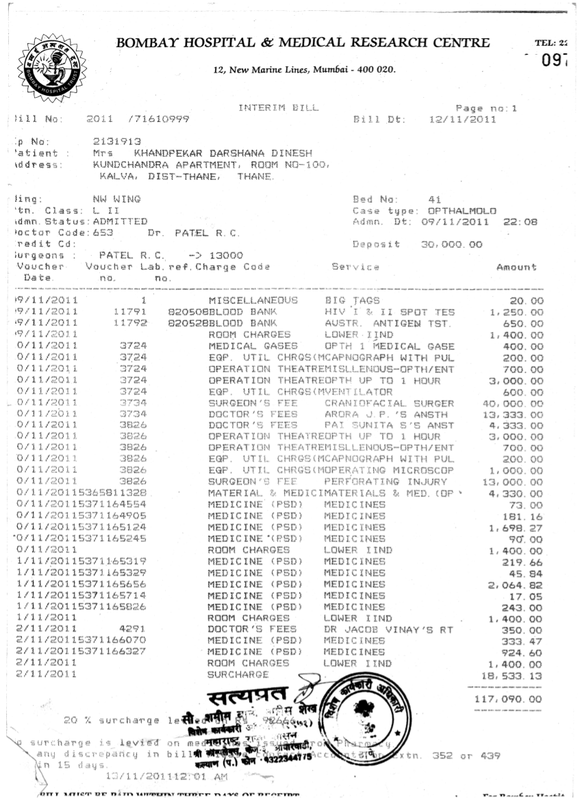 Oriental Insurance Rejects Mediclaim Claim Because Hospital Reduced Bill ! In November, 2011, I had written about the maid in my office who met with a freak accident and lost her eye when someone chucked a stone that hit her while she was travelling by Central Railway local train. This is a sickeningly sad and cruel sequel to this poignant story. Darshana was admitted to Bombay Hospital where she underwent re-constructive plastic surgery on her nose bridge that was shattered; and on her eye, where the entire socket was crushed. She had to stay indoors for almost a month after she was discharged from hospital, wearing dark glasses. During this convalescence period, she remembered that she had paid for a Mediclaim policy and, after some looking around, was relieved to find that it was valid and covered upto Rs.50,000 of medical expenses. When it came up for renewal, she somehow scrabbled around for money and paid the premium and renewed it, as she now realised more acutely the value of health insurance. Darshana had so much goodwill with her several employers that they pooled money and helped her pay most of her hospital and post-hospitalisation costs. The hospital bill came to Rs.1,17,090 and, after explaining the circumstances and pleading for a lower bill, the doctor and surgeons' fees were waived, and a final bill of (-)48,022 was issued representing the reduced charges. 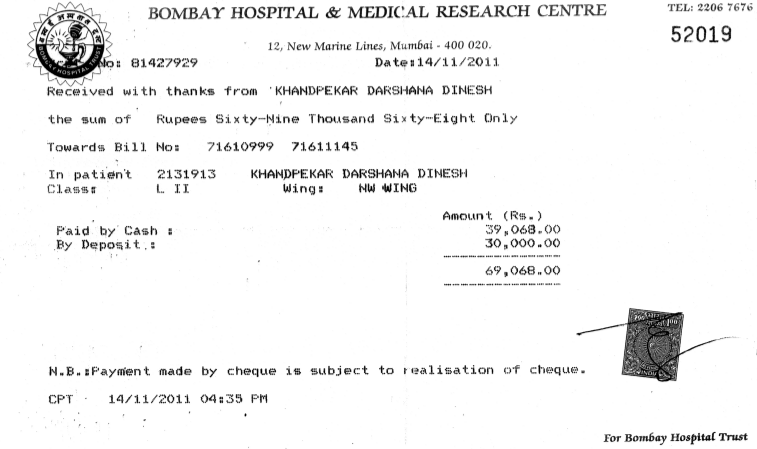 She managed to collect the Rs.69,068 needed to pay off her hospital bill. Barely three months later, Darshana's husband died. Now, she was required to be the sole breadwinner for her aged mother and 11-year-old son. Now let us get back to the saga of her Mediclaim policy with Oriental. She managed to file her claim in respect of the policy about a month after the accident. The TPA (MD India) first rejected her claim saying that she had not intimated them within 24 hours of the accident. We explained her circumstances to Oriental Insurance, and the fact that she did not know that the insurance company needed to be intimated immediately, and the technical defect was condoned. (2) the final bill was not submitted; and that only an interim bill was submitted. Since our policy cover was Rs.50,000 and there were NIL exclusions, obviously, if an expense of Rs.69,068 was spent, the claim amount would be Rs.50,000. This is also obvious from the policy document itself! Hence, the first ground of repudiation was a lame, hypertechnical ground. 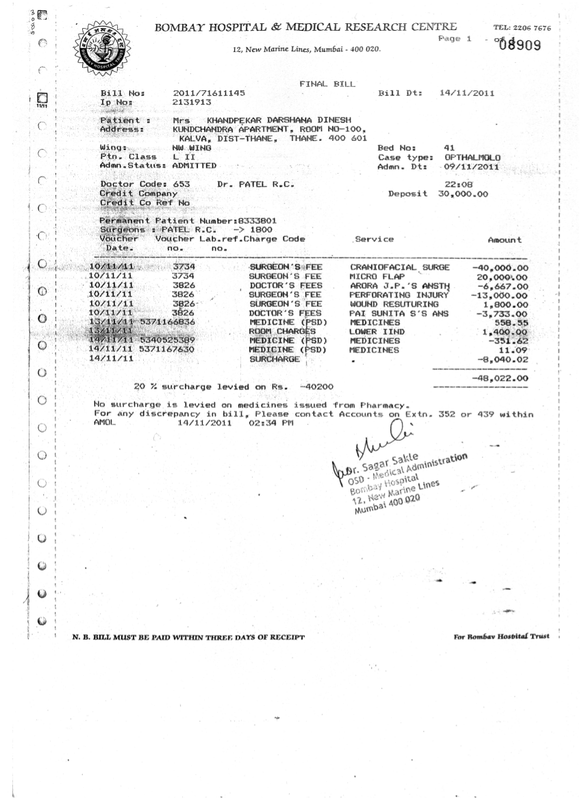 The second ground was a patent untruth as Darshana had submitted the original final bill. In any case, we emailed them a copy of the same. When we spoke to the MD India Head for Thane, Mr Pallaw Saxena, and the officer (Ms Rema) at Oriental Insurance, they agreed to consider our submissions. In just 2 more days, we get an email telling us that the claim has been rejected - for a new reason - that the Final Bill sum is negative. By citing the Final Bill, they have admitted that the second ground in the Pre-Repudiation Statement was an untruth! 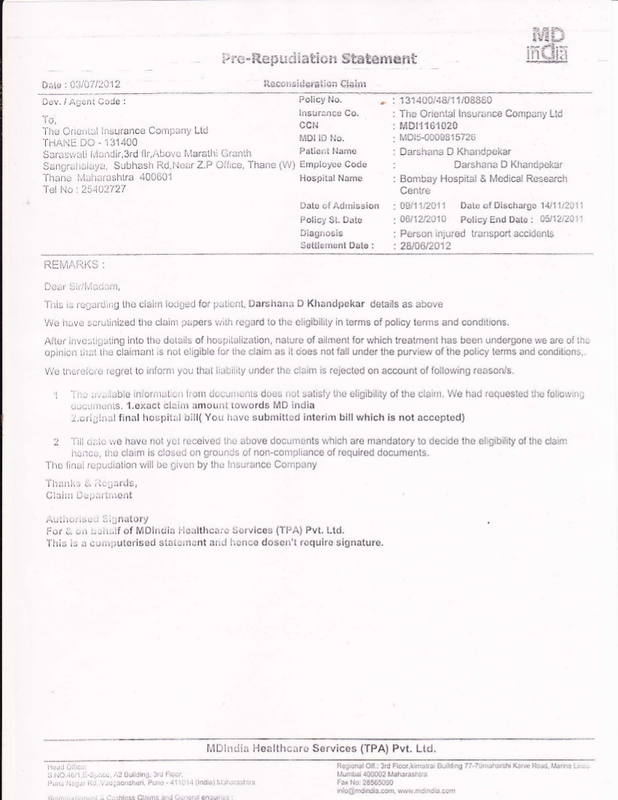 Worse, effectively, they have rejected the genuine claim because the Hospital reduced its bill! We explained the obvious to both, Mr Saxena, and Mr Adhav, the Divisional Manager of Oriental Insurance in Thane - that these two bills were running bills, and the arithmetic sum of these bills was the same as the receipt amount - and the receipt mentioned the two bill nos that the payment pertained to. Yet, as of today, a third blow has hit Darshana - her genuine, valid health insurance claim has been rejected. Of course, I await the formal letter from oriental Insurance, but going by the unhelpfulness of the Oriental Insurance people, I do not expect a reversal of decision, going against the TPA's (dishonest) rejection of claim. Now we have to find out what grievance redressal mechanism is appropriate. Grievance Cell of Oriental? Ombudsman? IRDA? Consumer Protection? Which forum is appropriate? In which order? Are any of them mutually exclusive? What are the next steps? Go to the Press? So many questions; and no clear answers. Need advice. Anyone who reads this and can advise, please tell us what to do next. If you know anyone who can help with advice, please share this with them. I have already begun the process by writing to the Chief Manager Customer Services Dept, of Oriental Insurance. 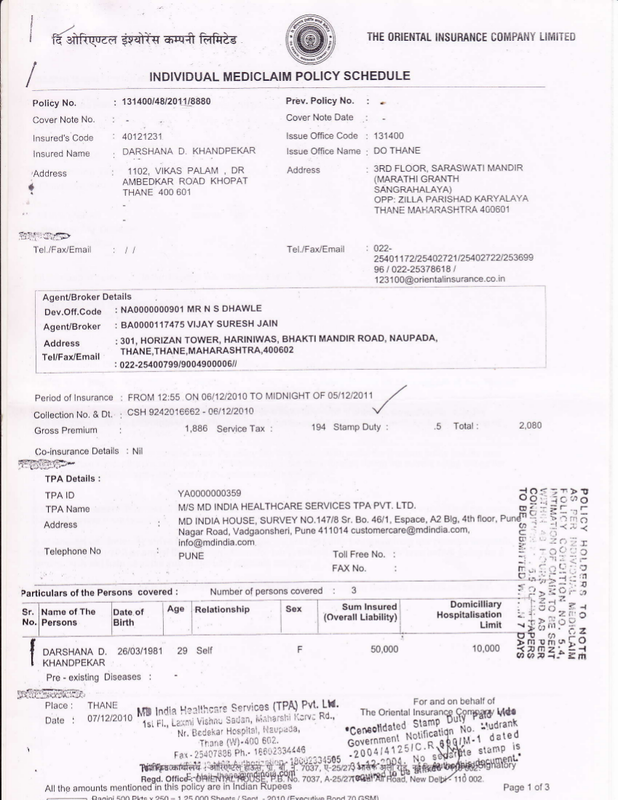 For whatever it is worth, I am uploading the scans of the Insurance Policy, the two bills and receipt of Bombay Hospital and the Pre-Repudiation Statement of the TPA. These documents are sufficient to justify Darshana's claim, and you can see for yourself the unfairness of it all. After our insistent follow-ups, it has reached a stage where both, Mr Adhav of Oriental Insurance and Mr Saxena of MD India are not picking up our phone calls. PS: Update: I am glad to report that since I wrote this entry, the TPA has quietly paid the claim, with not so much as an explanation for the change of heart. The amount has been credited to the lady's bank account today - Jul 28, 2012.